It's an opportunity-filled world for those with data-science skills; for everyone else, the question is mostly how to get them. That's where DataCamp comes in. Founded in late 2013, the online data-science school offers training for students and professionals alike, including those who want to make a career switch. More than a few of its customers are large companies and universities. 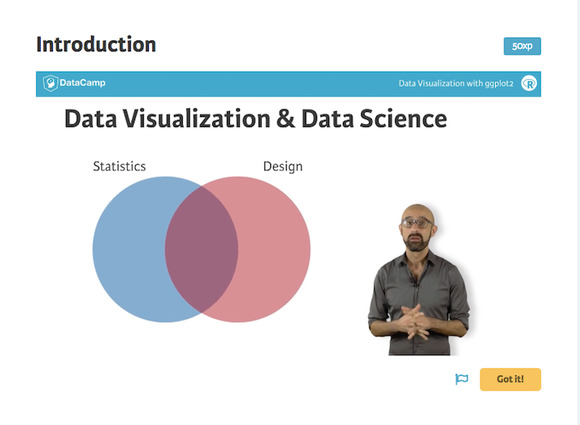 Data visualization, dynamic reporting, R programming and large data sets are all among the topics on DataCamp's curriculum. Courses don’t follow a traditional academic format, though; instead, DataCamp uses short video lessons and online programming challenges to teach the material, all of which is delivered through a browser. Rather than degrees, students earn badges and statements of completion for each course they finish. On Thursday, DataCamp announced a fresh $1 million in funding and also important new capabilities for enterprise users. With the new DataCamp Groups feature, organizational team leaders can coordinate teams or classes, track their students’ progress and see how their skills evolve over time. A leaderboard is designed to make the learning environment fun and engaging. Roughly 300,000 people have now taken courses through DataCamp, and one of the most common requests from teachers incorporating it into their own data-science classes was the ability to give assignments to a group and monitor students' progress, said Jonathan Cornelissen, DataCamp's founder and CEO. Brigham Young University, Princeton University, the University of Chicago, the University of California at Berkeley and Harvard University are all among DataCamp's users. At Berkeley, more than 300 students use the platform, Cornelissen said. Consulting firms and companies such as Airbnb are also using DataCamp internally, he said. It's all part of the ongoing scramble to meet the skyrocketing demand for data-science skills. There's a chronic shortage of data scientists, recruiting company Glassdoor says. "There's such a shortage of people who have basic data literacy," Cornelissen said. Rather than trying to hire new staff, many companies are electing to retrain the existing workforce. For many employees, it's not much of a stretch: "A lot of people with STEM backgrounds could pick up these skills very easily," Cornelissen said. At DataCamp, some classes are free, but students can also pay a subscription fee of $25 per month or $250 per year for access to all the school’s offerings. Organizational discounts are also available. DataCamp’s total seed funding now adds up to $2.3 million. It's planning to open a new office and double headcount over the next several months as well as build out its course catalog. Other places to get data-science skills online include Coursera, edX and Udacity.